Whether you commute to work, or tear up the trails on the weekends, a backpack designed for your specific cycling needs can significantly improve your riding experience. A good cycling backpack usually sits on your lower back to lower your center of gravity.Cycling backpacks come in a variety of sizes and materials, and are usually purpose-built for a certain type of cycling. Choosing the best mix of features for your specific needs will keep you riding comfortably when you’ve got to carry a bit extra. There are commuter backpacks designed specifically for use on a bike. These packs usually have a capacity between 10 and 25 liters, which gives you enough space for your laptop, jacket, a book and a lunch-bag. Commuter backpacks almost always have an attachment point for a safety light, and some also have a pocket or strap for attaching your helmet when you’re not riding. Look for a bag with separate outside pockets to keep your heavy bike lock and tools away from your bag contents. 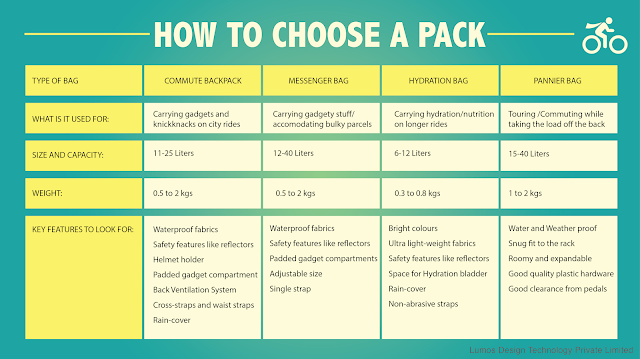 A waterproof liner and a durable outer fabric are some of the most popular features for commuter backpacks and messenger bags for commuters who get stuck in inclement weather; a ruined laptop is worth the extra weight of a sealed bag. The back panel of these backpacks is usually designed for comfort, and can feature a trampoline-style backing that allows good airflow across your back while riding, preventing excess perspiration. A strap across the waist keeps these bags stable on your back so you can balance properly. Bike messengers and students alike have long used a messenger backpack for cycling. The one-strap construction allows the rider to swing the bag to their front when stopped so they can access the contents without having to dismount or take off the bag. Messenger backpacks are sometimes designed with huge capacities (upwards of 40 liters), and feature long straps on the top flap to secure unwieldy items like packages for delivery. For students and commuters, these bags can be useful if your ride sometimes involves extra-large loads. 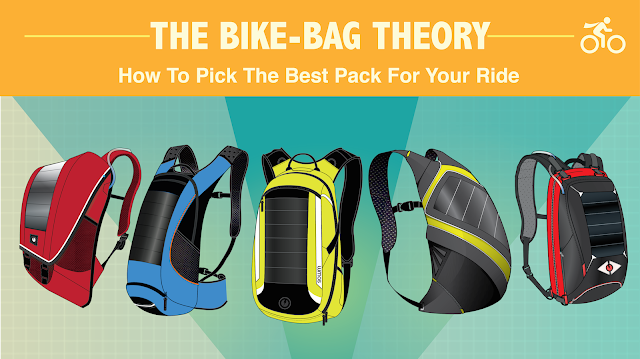 Backpacks designed for mountain biking and bike-packing are very technical and usually very lightweight. These backpacks aren’t usually waterproof to save weight, but they’ll have a hydration reservoir and a tube for carrying a few liters of water on longer trips. Most feature outer pockets or cords for stashing extra items like a windbreaker on the outside of the pack, and they’re designed to sit lower on your back so they don’t encumber the balance of a rider who routinely goes off-road. Hydration packs fill a niche for riders who need to carry a few hours worth of water with them. Panniers, named after the word for “baskets” in French, can be located on the rear or front of your bicycle. Panniers are a great way to carry your gear safely and easily because they offer extra storage and take the weight off your back. The most important considerations for commuting panniers include ease-of-use, organisation, and protection from those rainy days. Some commute panniers come with organisational pockets to keep all of your work knickknacks, while others have a more open pannier design for carrying bulky items. Several panniers also incorporate protective sleeves to guard your laptop from the inevitable bumps. If you’re commuting to work, it is best to just use the right-side pannier to keep it away from the traffic side.